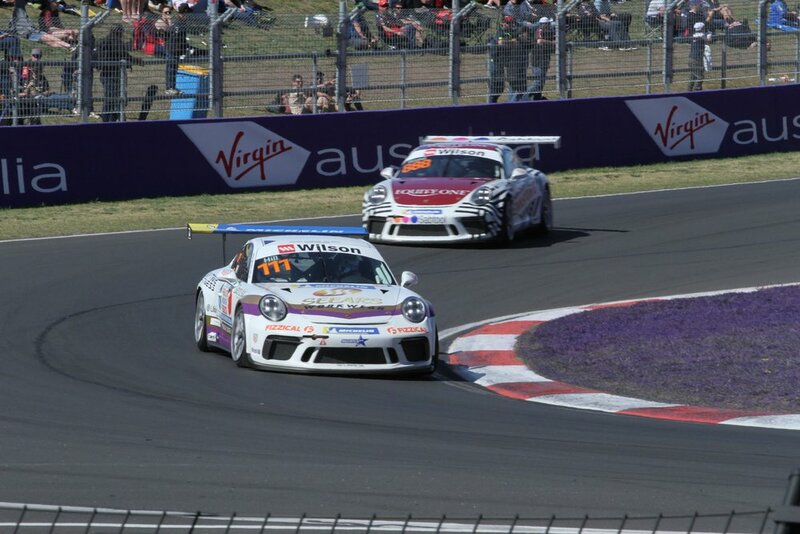 Cameron Hill has continued his season-best Carrera Cup form at the Bathurst 1000, coming up with another fourth-place finish in Race 2 at Mount Panorama this afternoon. Hill slotted into fourth at the start, and maintained the position for the entire seven lap duration. Hill largely stayed clear of any close battles, and said the race provided a good opportunity to further explore his Porsche’s handling characteristics over the top of the Mountain. “I gained an understanding of where I still need to gain time compared to the front-runners,” Hill said. “I didn’t quite have as much speed as the top three drivers, but I was comfortably ahead of the next group of cars. “I was testing the limits and at one point I had a moment heading through Reid Park, but fortunately I kept it off the fence. “Sometimes it’s nice to have an uneventful race where you can just enjoy the experience of driving a cool car around Bathurst. “I’m pleased to have kept the car in one piece, and I’ll be thinking carefully about what I can do to push for a top-three result tomorrow,” Hill concluded.